One area I study is digital poetry, and there’s an obvious connection there between the text and both the medium on which it was written and the medium on which it is read. I often point to bpNichol’s First Screening, a very early (1983) series of programmed kinetic poems that was written in Apple BASIC on an Apple //e as an example of how important a text’s relationship to a medium is. The poems were written more than thirty years ago, and now, they are essentially gone. There are emulations out there (check them out at vispo.com/bp), but the emulations are very clearly not the same poem. Watching a QuickTime movie of the poems on your MacBook Pro is not the same experience as turning an Apple //e on, inserting a 5 ¼ inch floppy disk into the drive, typing “run” on the black screen and listening to the drive start to turn and grind. The bodily relationship to the poem is changed. Studying the relationship of media to literary texts is, in a certain sense, acknowledging the crucial element of the body in that mix. I mention First Screening because it clearly illustrates this relationship, but what I’ve come to understand is that all literature is inextricably tied to the medium upon which it was written and the medium upon which it is read. Over the past few hundred years, we’ve gotten rather used to reading in a single medium, the codex, but it is still a medium that determines a certain physical, bodily relationship to the text. Clearly, today, we no longer only read printed literature, and we read differently because of that. This deserves scholarly examination. Changing technology also alters the way we write. Writers have talked about this as long as there has been writing. Consider Plato’s claim in the Phaedrus that the technology of writing itself removes speech another step from truth. Consider Charles Olson’s “Projective Verse,” in which he praises the typewriter as a medium that, “due to its rigidity and its space precisions…can, for a poet, indicate exactly the breath, the pauses, the suspensions even of syllables, the juxtapositions even of parts of phrases, which he intends.” Adam Bradley writes in Ralph Ellison in Progress that in 1982 Ellison got an Osborne 1 portable computer (which had a 5 inch screen!) with the word processing program WordStar, and “something fundamental changed when he began writing on the computer, affecting both his means of composition and the fiction that resulted from it.” It became work that was always in progress, always sectioned in fragments, always revisable. 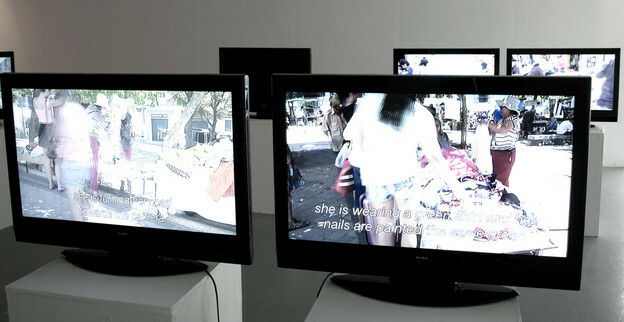 Media archaeology examines the historical development of reading and writing technologies, where instances of technological “advancement” (e.g., Graphical User Interfaces) obscure the once possible alternatives that could have led to very different ways of writing, reading and thinking, and it acknowledges the body’s role in the production and reception of text and meaning. And it’s kind of fun to play with old computers. If you believe that media archaeology largely coalesces in the writing of Friedrich Kittler, then media archaeology wouldn't exist without literary studies! As others before me have pointed out, in many ways Kittler's Discourse Networks works because of all the literary examples he relies on to make his argument—examples of how, after 1900, literature registers what he calls "a histrionics of media." While he does also write that 1900 equally marks the disintegration of poetry, I've always thought what he really means is that this point marks the disintegration both of what had, up to that point, appeared to be the necessity of creating lyric, expressive poetry and of poetry as an art form that depends on creating the seamless, naturalized illusion of the human as separate from, above and beyond, the technological world. So, of course people continue to read and write lyric poetry all over the world after 1900; but now the poetry world is augmented with pieces that are non-semantic gurgles, grinds, glitches, eruptions, shrieks, howls, and so on—pieces that register the media effects of their time (I'm thinking of the Dadaists' and Futurists' visual and sound poems or dirty concrete poetry by Steve McCaffery or bpNichol's and John Riddell's experiments with the photocopier). So while I do use the Media Archaeology Lab to work through a version of media archaeology that concerns itself with excavating failed media or dead ends in the history of technology, I am equally fascinated with what I've been calling "media poetics," or poetry that registers media effects and that does not necessarily demand hermeneutic interpretation. For me, media archaeology's most significant contribution to literary studies is the way it frees us from constantly, and only, interpreting content and allows us to go back and re-see poetry from the 20th and 21st centuries as inscriptions that record experiments with the limits and possibilities of writing media. In this case “how can” could also be first approached through “how has”: how has media archaeology influenced and informed literary studies? And how has media archaeology informed literary studies also becoming a question of how it can, could, might—a field of potentials in making language work by way of realising its relation to the wider question of “media” and its materiality even in informational systems. And that approach can be extended by way of art practice, as we elaborate below. Besides, “inform” should be really taken literally, to refer to information theory the way German media theory such as Friedrich Kittler’s has suggested to approach literature. And also how archival practices of information management have to be taken seriously when considering the work of text/literature in the age of archive enthusiasm. Firstly, literature was already at the core of media archaeology, at least in the way Friedrich Kittler’s early work turned from studies of literature (he was, after all, a Germanist working on Goethe) to studies of media. Texts never disappeared from his mind or writings. They became embedded as part of an informational theory of literature as media: less hermeneutics, more Shannon and Weaver + information theory. While concrete poetry was changing the relations of image-text we could also focus on the Turing-age of computability, visible of course in certain postwar currents of text-art (in Germany) too. Secondly, one can observe the emergence of exciting studies of literature as material media; this means looking at the material paratexts and the supporting infrastructures, technologies and also techniques. Works by Matthew Kirschenbaum, Till Heilmann, Lori Emerson and Darren Wershler are some of the good examples of this sort of approach to the bureaucratic, poetic and media-oriented history of text and writing. As we know by now, text is not for reading. It is for processing. Ask any machine reading system and it will tell you the same. Thirdly, we are interested in how creative practice can inform a rethinking of the literary from a media archaeological and archival system. This means not only looking at literature as an information system but how it is being archived and processed in information systems. In Jane Birkin’s art practice, she stages cultural techniques of the archive as ways to investigate textuality. This approach both borrows from Kenneth Goldsmith's uncreative writing and develops a media archaeology of the text. Here it is not the texts themselves that are appropriated, but the established rules and techniques of archival description and listing. The resulting new texts take on a human/non-human hybridity that can be seen in all levels of archival description even today, as well as in other information management systems generally. This hybridity is already a topic of media archaeological discussion and is apparent too in examples of earlier conceptual writing such as that of Sol LeWitt and Dan Graham, where the practices of writing and making are based upon design of instruction or workflow. Birkin uses a predetermined and tested workflow, and, in line with archival description techniques, does not attempt to assign meaning to objects described. Using film installations, the work asserts a tight control on reading that explores the complex orders and temporalities of the archive itself. The media archaeology of description becomes a method of addressing the way in which texts and literature work as and in information systems. QUICK QUESTION: If you could ask someone just one question, what would it be? Quick Question turns this game into a reality. Asking quick but pressing questions of poets, scholars, students, and artists, Quick Question publishes 500-word responses to some of modern and contemporary poetry’s most basic, urgent, compelling, or difficult questions. Multiple answers to single questions are posted on a rolling basis in order to make space for multiple points of view and continuing conversations. Quick Question welcomes inquiries and submissions. To propose a question, suggest a respondent, or submit a response, please email Katie Price at price.katiel [at] gmail.com. Can poetry have a socio-political impact?